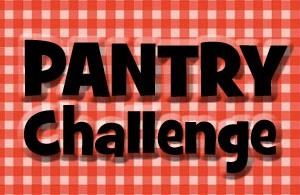 The month is officially half over and I fell like the pantry challenge is going well. We had a few bumps in the road (while I was out of town my husband broke down and bought a bunch of cold cereal, something I never buy) but I’m pleased with our progress. At the start of the month I wanted to focus on 4 things. Here is how we are doing on those things. Pantry is Organized. Yeah! And the best part it only cost me $12.00 for the boxes and I had the fabric, paper, and ribbon. After looking around for good containers I ended up a Shelf Reliance Cansolidator to organize my canned goods and bankers boxes and a to organize all of the loose things that were floating around. The Cansolidator that I have is one of my favorite things. The Christmas after I was married my Mom gave me come can rotators that I used for years. They were a nightmare to set up, but they did get the job done. A while ago I won a Cansolidator Pantry Plus and I LOVE it. It is easy to set up, easy to use, easy to change. It is the large size and hold 60 cans which for me is enough to have in my kitchen. I keep everything else in my cold storage. Banker’s boxes are inexpensive and sturdy. I use them for everything. I wanted them to be “cute” so cut up some fabric (dark canvas works best, I used canvas that I bought at Wal-Mart) and used spray adhesive to affix it. After letting it air out for a while, the spray adhesive is super stinky and should be used outdoors. I printed out some labels and tied them on with ribbon. The entire project took me 3 hours and I am really happy with how it turned out. Freezer has been cleaned out and organized. Yeah! It is still lacking a in the meat department. As I organized it I realized that I am totally out of Chicken, hamburger, and freezer meals. But on the upside I do have a lot of freezer jam and frozen fruit cocktail. I thought I was out of booth. Creating menus that my kids will like and that focus on foods that we already have on hand. Since I have been focusing on what my kids like to eat I have had a lot less complaining at dinner time. Each week when I plan the menu for the week I asked each person what they want to have AND if we have the ingredients to make it than we have it. My daughter really like spaghetti and meatballs so we have had them twice already, although I would not normally it so frequently, it has made my kids happier at dinner time. Lowering my food budget. So far we have spent $184.02 on groceries. Since that includes the grocery shopping for this week, I feel pretty good about that. Usually I spend $100 per week. So for three weeks we have saved $115.98. So far so good. Our largest purchase by far is on produce. We eat a lot of produce, I purchase it at the grocery sore and each month I participate once or twice in the Bountiful Baskets Food Co-op. If you are unfamiliar with Bountiful Baskets it is a food coop that focus on fruits and veggies, and has a few add ons each week. We love the 9 grain organic bread so I buy 10 loafs at a time and freeze most of it. This is what we got in our basket this week. Evaluate my food storage. What I have learned so far. 1. We need to store more soup. My daughter wants to eat Progresso Italian Wedding Meatball soup every day for lunch. When Progresso is on sale it is less than $1 per can. This is a good deal since three of us eat one can. 2. We need to store more ready to eat foods and freezer meals. I seem to go in waves and we currently have nothing easy to pull out of the freezer. I’ve been wishing for a frozen pizza, cheese ravioli, ham fried rice, pot stickers and egg rolls. My kids have been wishing for mini hamburgers. It looks like this week I'll be making some freezer meals. 3. We have a LOT of jam. I love to make jam and sometimes I get a little carried away. Okay it is totally out of control but delicious.